Here’s my latest The Other Side column for ConservativeHome, published here on Tuesday. Their headline accidentally omitted the ‘to’ – “What Clegg was really up last week” is a whole other column. My thanks as ever to the site’s editors, Paul Goodman and Mark Wallace, for giving a Lib Dem space to provoke – constructively, I hope. Last week was a big week for Nick Clegg. It began with him floating the prospect of the Lib Dems teaming up with Labour after 2015. And it ended with Nigel Farage reluctantly accepting the gauntlet thrown down by the Lib Dem leader of an in/out debate on British membership of the EU. “I wonder what he meant by that?” asked Metternich on hearing the news that Talleyrand had died. Here’s what I think Clegg meant by last week. Labour currently lead the Tories in the polls by around 5%, enough to deliver a healthy working majority. But that lead will likely tighten (and perhaps disappear) the nearer we get to the D-Day of May 2015. In a close-fought election it will be the marginals that decide the outcome. With the party already committed to major cuts, the prospect of repeated rebellions from the left, destroying the government’s ability to deliver its agenda, is one that strategists are keen to avoid. Which is why Labour’s leaders are now privately committed to a new Lib-Lab coalition. That’s the context in which Clegg’s comments are best read. In part, he’s preparing the ground for what may be. In part, he’s reaching out to those 2010 Lib Dem voters who’ve peeled off to Labour. And in part, he’s laying down a marker for any post-2015 negotiations – it is, after all, a crucial part of the brinkmanship needed to secure a good deal for his party and its supporters that Clegg can convince both the Tories and Labour that he’s prepared to form a Coalition with the other. It’s an odd accusation given Clegg’s strategy for 2015 could not have been more explicit nor more unwavering. His unabashed aim is to occupy the centre ground of British politics, conveniently vacated by Labour and the Conservatives as they pursue the ideological purity demanded by their activists. ‘A stronger economy, a fairer society’ – that’s the party’s slogan for the next election, deliberately pitched to persuade those who worry about the Tories’ tendency to overlook the downtrodden and Labour’s tendency to overlook how we can afford to help the downtrodden. Which brings us to Mr Farage and that debate. 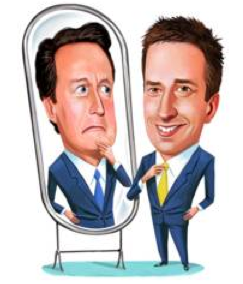 Clegg has little to lose by challenging the Ukip leader to a face-off on Europe. The two parties are at opposite ends of the ideological spectrum, appeal to very different sets of voters. To Clegg, Farage is a useful enemy, a clear and present danger who may yet galvanise the one-third of voters who want the UK to remain within the EU to consider casting their vote for the Lib Dems on 22nd May – a new kind of protest vote. As importantly for the long-term, Ukip’s current popularity underscores that the two-party system is dead. There were some, both in the Labour and Conservative parties, who hoped that one term of coalition would detonate the Lib Dem threat and that British politics would soon revert to its cosy red-and-blue duopoly. In reality, the Lib Dem loss of the plague-on-all-your-houses vote opened up a space which Ukip has deftly exploited. Leaders are often weakest when seemingly at their strongest and strongest when seemingly at their weakest. This paradox works for Clegg right now. His strategy is set. The Lib Dems will occupy the centre ground where you’d expect to find a moderate, progressive, small-l-liberal party: financially responsible yet socially caring, pragmatically pro-European, a bulwark against both left and right. Disagree with it all you like, but it’s clear where he stands. That’s what last week was about. It’s what every week will be about from now until May 2015. And – who knows? – maybe beyond.